is slightly heavier than Shepherd Sock. Lorna's Laces colors are far from traditional. Have a fabulous time knitting or crocheting with the unique hand dyed colors in Shepherd Sport. Shepherd Sport is an ideal weight for lacey shawls or wraps. Works up into a somewhat delicate sweater, great for spring time weather. Be sure to check out our patterns in Shepherd Sport on Ravelry. 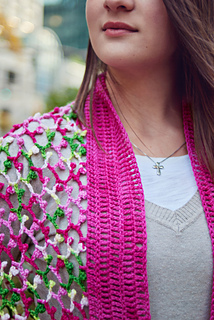 Color used in both the crochet and the knit shawl is City of Roses. A color designed by Angelika and dyed by Lorna's Laces.